Can I or should I use tire dressings on my tires? What are the loads/inflations I can carry in my tires? How do I store my tires? When should I replace my tires based on age? How do I store my vehicle without removing the tires? When do I need to rotate my tires? 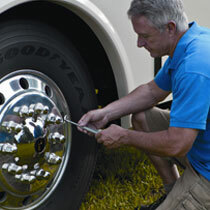 Many owners like to use a variety of products, some of their own making, to either "shine" up their RV tires or prevent weathering and "dry rot". To combat weather cracking and dry rot, Goodyear uses anti-oxidants and anti-ozonants not only in the tire sidewall but in the tire casing as well. These anti-oxidants and anti-ozonants slowly make their way through to the sidewall to keep the sidewall looking great for many, many years. Anti-oxidants and anti-ozonants protect the tire from ozone, UV light, and sunlight. As far as making the tire look shiny, there are a variety of products on the market today. We do not recommend or endorse any specific product. Just stay away from any petroleum based product which can react to the rubber. Using soap, water, and a medium bristol brush will keep the sidewall clean and the whitewall looking bright. For Load and Inflation tables for Goodyear RV tires, click here. The best place to store tires is a clean, cool, dry, sunless area away from strong air currents. Even though the rubber used to make tires is formulated to resist the effects of sunlight, ozone, and water, the life of a tire can be extended if exposure to these elements is minimized during storage. There are many variables that could dictate tire removal/replacement relative to age. 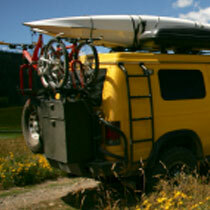 Some of the obvious would include: mileage, usage per year, and vehicle storage practices. 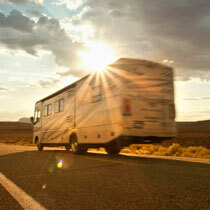 Many RV owners replace tires when the tire manufacturer's standard workmanship and material warranty expires. Goodyear's warranty on Unisteel Radial Medium and Light Truck tires expires at 4 years from date of original manufacture or new tire purchase date. The warranty on Goodyear's Premium Radial tires expires at 5 years from date of original manufacture or new tire purchase date. If you do not generate many miles per year on your RV tires and store the vehicle out of the sun, your tires will last many, many years. The purpose of tire rotation at regular mileage intervals is to achieve uniform wear on all tires. Before rotating your tires, consult your vehicle owner's manual for rotation recommendations for your particular vehicle. The first rotation is the most important. If the tires show uneven wear, ask your Goodyear Service Manager to check for and correct any misalignment, imbalance, or other mechanical problem before rotation. Proper wheel alignment is essential to even treadwear. The normal wear of moving parts in a suspension system results in misalignment. When this happens, tires don’t run as straight and free as they should. The result is tire scuffing and rapid, uneven wear. Have your vehicle’s alignment checked regularly and adjusted to the vehicle manufacturer’s specifications. How does ply rating relate to load range and the actual construction of a tire? Is running tires at near rated or rated load a problem? The term "Ply Rating" is used to identify a given tire with its maximum load when used in a specific type of service. It is an index of tire strength and does not necessarily represent the number of cord plies in the tire. The term "load range" with a letter (A,B,C, etc.) in tire identification is used to identify a given tire with its load and inflation limits when used in a specific type of service, as defined in headings of TRA tables. In summary, the 'ply rating' and 'load range' are indicators of the actual load capacity of the tire. This rating has no direct relationship to the number of plies. For proper fitment the tire must have a load capacity capable of carrying the maximum load of the vehicle in service. Both the load and speed capability must be considered in the fitment of a tire as there is a direct relationship of load and speed. All vehicles, on the highway, are required to identify the proper tire size and load requirements on the placard found in the driver's door. For alternate sizes consult with a local Goodyear tire dealer. Tires are designed to run up to the load and pressure written on the tire sidewall. Unless you have actually weighed your loaded vehicle and adjusted the inflation pressure to carry that load, maintaining proper tire inflation pressure as indicated on the vehicle placard is the number one issue facing RV owners today. Air is what carries a tire's load. If you run tires with air pressure below the placard recommendation, or below the inflation required to carry the actual vehicle load, nothing but problems will occur. Irregular wear increases, mileage goes down, fuel economy gets worse, and tires may be damaged or destroyed. Checking your tires with a calibrated air pressure gauge weekly is strongly recommended. What is the difference in a trailer specific tire and regular passenger tire? My tires have the word "groovable" on the sidewall. What does this mean? Trailer tires are considered a special category in the current global design standards of Tire and Rim. The major difference is that trailer tires are required to carry 10% more load than an equivalent P-metric size tire. LT type tires are actually on a lower formula and would require a significant size or load change to meet the trailer load requirements. In the design process, we evaluate what works best under trailer applications/conditions. We typically find that a narrower tread width and a shallower non-skid (tread depth) provides a better overall performance in a free rolling position. This is one case where wider is not better. There are significant design differences with these tires and this explains why trailer tires are in a special category. In addition, that is why we recommend using trailer designed or trailer specific tires in trailer towable applications. Most commercial truck products (all brands) have sidewall stamping designating them as regroovable. Regrooving is typically performed on tires used in metro bus service. When bus tires get worn, there is a regrooving machine which actually cuts grooves on the worn tread so that these bus tires can continue to run prior to retreading. Bus tires are designed with extra rubber under the crown area of the tire. 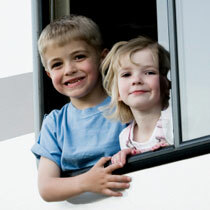 RV owners should not be concerned with regrooving their tires. We know you're eager to get on the road. But you've got a question about your tires. Not to worry. Chances are, the question has been asked before. Just click on the categories below to see frequently asked questions. If you don't find the answer you're looking for, just send your question to us and we'll try to answer it for you.